(TSM’s BestChuckNa, FlashX and VONC. Photo from Twitter). FlashX is the only player in North America to own two Live Championships, and it’s no fluke. He’s consistently reinvented the meta with each patch update with his innovative team composition ideas and builds; many top players find themselves adapting to FlashX’s strategies. In the Summer Season, FlashX showed why he is the greatest leader in Vainglory Esports. He assembled a brand new roster, struggled through some of the biggest failures in his professional career during the first split of the Evil Eight but eventually persevered and finished the season in dominant fashion. Whether it’s constructing a roster, developing new strategies or enforcing an effective practice schedule for his teammates, FlashX is the single biggest reason why TSM’s venture into Vainglory has been a massive success. 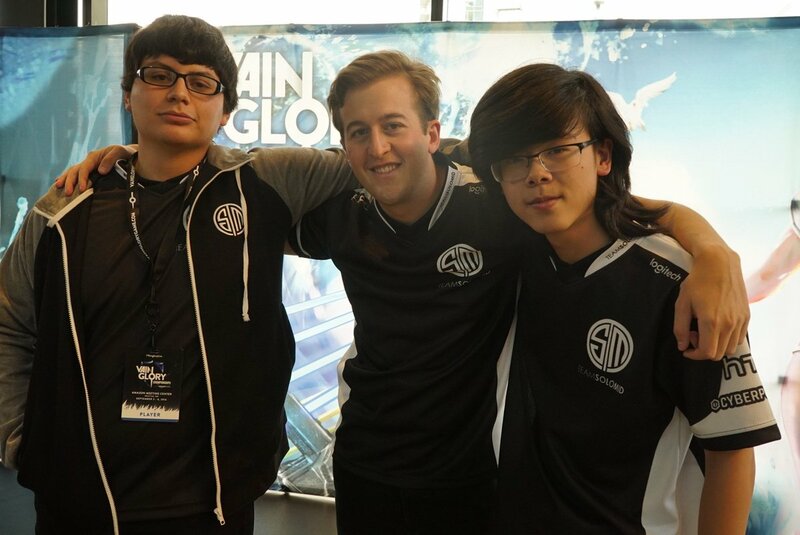 TSM bootcamped for over a week leading up to the Summer Live Championships, and it paid off. TSM completed the most dominant performance in Live Championship history by going undefeated throughout the entire tournament, including a clean 3-0 sweep of last season’s champions, Hammers Velocity. It feels like Phoenix Reign and Hammers Velocity have clashed more times in high stakes matches than any other two teams in recent history. Although outcomes have varied, a thrilling series has been guaranteed whenever these two teams face each other. This series was the most exceptional of the Summer Live Championships, with the two teams going the distance. Game 1 went fairly easily to Velocity. Game 2 was completely dominated by Velocity, who was up 14-1 in kills at the 15-minute mark, before Reign completed a thrilling comeback to take the game. Game 3 was an intense back-and-forth match with Velocity pulling out the win to automatically qualify for the Semifinals. Although Cloud9 came into the Summer Live Championships as the fifth-seed, they were the heavy favorites over the fourth-seeded Phoenix Reborn. C9’s hype heading into the championship weekend was intense, with fans across the world celebrated their acquisition of Nemesis Hydra. Game 2 of C9 vs. Reborn was the most lopsided match through the 15-minute mark, with Reborn taking an 8-0 kill lead and completely controlling the pace of the game. After a great engage by LostBoyToph at Kraken at the 16-minute mark, C9 turned the game around and slowly fought back into the game, one team fight at a time. TSM caught Ardent Aurora by surprise when VONC went with a jungle Crystal Power Phinn. Phinn’s Polite Company into BestChuckNa’s Kestrel’s One Shot One Kill wombo-combo’ed Yazaru3’s Skye in Day 1, Round 1 of the Summer Live Championships. The two Phoenix teams met in the Loser’s Bracket finals, with the winner advancing to the Semifinals against Velocity and the loser going home. Reign took Game 1, and on the heels of elimination in Game 2, R3cKeD saved Reborn from elimination in the 22nd minute by stealing Kraken from Reign with just a Forced Accord. Not only did the play inject new life into a Reborn team that was playing on their heels, but it also ignited the late night crowd who had faithfully stayed to watch the final match of the night. Cloud9 eliminated Hammers Kinetic in the Loser’s Bracket Finals in Day 2 to advance to the Semifinals, and it was done in spectacular fashion. Although Cloud9 controlled most of Game 1, Kinetic’s team composition scaled better late game and Kinetic started winning late-game team fights. C9 secured the Kraken, but Kinetic engaged on C9 and won the team fight. With C9’s Hardek down for the count, LostBoyToph and iLoveJoseph proceeded to execute one of the clutchest plays in Live Championship history. LostBoyToph flared the perfect locations to provide iLoveJoseph, who had just a sliver of health, vision to avoid Kinetic. LostBoyToph sacrificed himself and to prevent Kinetic from recalling back to base to fight Kraken. Meanwhile, iLoveJoseph cleared the scout traps in Kinetic’s base to eliminate vision, and swooped in at the last second to explode the vain crystal for the win!